Since its inception in 2011 as a public health initiative intended to provide the Villa Park community with health-conscious choices and support, the “Grow Healthy Villa Park Coalition” has made a series of strides toward strengthening the health and wellness of its community. Last year alone, the group’s community leaders invested $21,407 in grant funds to both improve and promote health strategies that are affordable and accessible to all those who visit, live or work in Villa Park. In the effort to nurture longer, healthier lives, Grow Healthy, Villa Park leaders collaborated to allocate more than $4,000 for an additional water fountain which doubles as a water bottle refill and pet water-feeder station within the community to encourage healthy beverage consumption within an area that encourages physical activity. The coalition also granted $567 to a local agency serving low-income families to purchase and sustain raised garden beds in which to grow local produce to disseminate to families in need of greater food security. Specifically, homegrown tomatoes and green beans were ultimately a great success as well as a popular request among those served by “First Things First,” a program provided through the Outreach House in Lombard, IL which serves Villa Park and Lombard children ages 3 and younger and their families. The Coalition also hired a grant writer who successfully secured a $10,000 grant to develop a large-scale community garden to facilitate local residents in growing their own healthy produce and sharing best practices in community health through the establishment of an exterior information center. An additional $1,000 was dedicated toward producing library materials to support a container gardening program and subsequent funds in the amount of $1,843 were allotted to deliver a curriculum for educating preschool and elementary-aged children in healthy habits and nutrition. The group also granted more than $7,500 among seven local feeding programs in order to purchase refrigeration/freezer units in which to store a greater capacity of healthy food options including lean meats, low-fat dairy, fruits and vegetables for local families in need. Organizations which benefited include Disciples Food Pantry, the Lombard-Villa Park Food Pantry, New Hope Community Church, the Outreach House, the Salvation Army, Schafer Elementary School and York Township. Beyond dollars invested, the Coalition also funded the promotion of recommended health strategies on the village billboard in conjunction with the website GrowHealthyVillaPark.org and continues to deliver the messages of improved health and hope through its individual supporting organizations, including Catholic Charities, the DuPage County Health Dept., Elmhurst Memorial Hospital, Greater Works Church of God in Christ, Russell Chiropractic, Schools District 45 and 48, St. Paul Lutheran Church, the Village of Villa Park, the Villa Park Library, the Villa Park Parks and Recreation Dept., Willowbrook High School, and Tri-Town YMCA, which was awarded the initial grant and convened the community leaders. 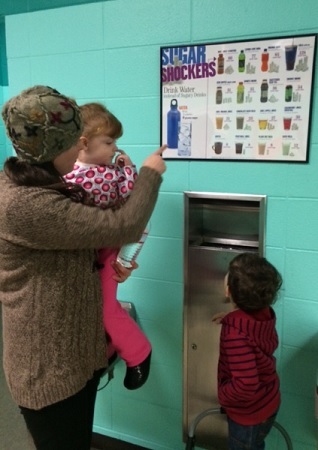 In prior years, the Villa Park Library has funded healthy cooking classes for interested participants and community leaders have displayed “Rethink Your Drink” informational posters in vending machine areas to demonstrate the high caloric and sugar content of soft drinks and juices. A bilingual nutrition and healthy living education program known as “Salsa, Sabor y Salud” has also been offered to area families, more than 100 of which have successfully completed the eight-week program toward learning about the benefits of greater nutrition and physical activity. To learn more about the Grow Healthy Villa Park Coalition, please contact Joanne Mitrenga, Executive Director of Tri-Town YMCA at (630) 629-9622, or email for more information.